Concordia Stingers goaltender Katherine Purchase was surprised, she said, when she was named co-captain of the women’s hockey team. “I didn’t even know I could be chosen as captain,” said Purchase, who never thought that it could be a possibility. Last year, coaches sat with Purchase to let her know they were considering her to be a leader of the team. Purchase wasn’t expecting to get a letter on her jersey, though—especially given The Réseau du sport étudiant du Québec regulations. Even if these kinds of regulations weren’t a factor, it tends to be uncommon practice to name a goaltender captain, simply given the nature of the position. 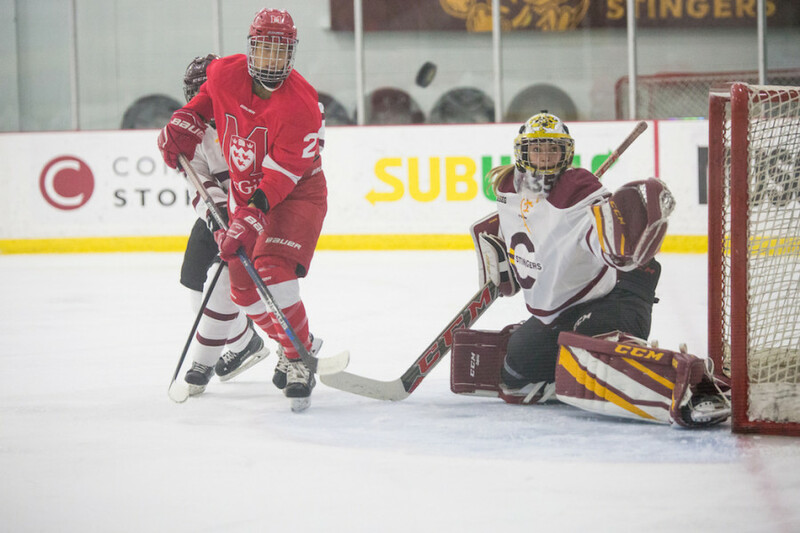 “It’s a little funny for goaltenders because while they are part of the team, they tend to be in their own headspace a lot,” said Stingers head coach, Julie Chu. Purchase does see herself as a leader on the team, but also pointed out the fact that a goalie can’t be the sole captain because of how separated they are from the players. There are limitations for Purchase as a captain during gameplay situations as a result of her position. RSEQ rules state that goaltenders may not cross the blue line during a stoppage in play, unless being replaced by a back-up. This keeps her from being able to interact with officials in the event of an incident. There is also the obstacle of not being able to handle matters on the bench, but in this case it might not be relevant. On-ice she has her co-captain, and Stingers defender Marie-Joelle Allard, as well as the team’s three assistant captains to handle any situations out of her hands. There’s also the fact that leadership on-ice doesn’t only lend itself to games. Keeping team practices and workouts in mind, and according to some of her teammates, she leads by example, proving herself to be extremely hardworking. Stingers forward Claudia Dubois said Purchase is a leader not only in the locker room, but also on ice. Off-ice, Purchase brings a positive energy to her teammates. Overall, her coaches and teammates feel she is entirely deserving of the co-captaincy. “It was never really my decision, it was the decision of her teammates and I think it was based on the tremendous athlete and teammate she is,” said Chu. According to her teammates, her presence in the locker room is large and inviting. Her ability to keep calm and pick up teammates who are down on themselves is hugely important, a testament to her leadership skills. “Kath is one of the role models on the team. […] She’s fun to be around. Her voice has a big impact in the locker room,” said Dubois. “She’s also accountable and she leads the team to success,” said Dubois. Having been on the team for three years now, Purchase noticed a vast improvement on the way the girls perform. She noted that during some games, the team doesn’t play to their full capacity, not capitalizing on all chances they get. Yet they still manage to pull off wins consistently. It was only recently that the team suffered their first set of back-to-back losses, only to pull out a big shootout win in the following game versus the Université de Montréal Carabins. Looking forward to playoffs, it could be anybody’s game. In terms of where Concordia might end up in the standings, Purchase is unsure, as we all should be given the tight nature of the league right now. Every team has beaten every other team at least once this year, and so things are on even ground.